After tasting the food, the children then went on to use their Phonic knowledge to create a menu for an Astronaut. They were so enthusiastic when writing some of the food options and the majority of children did this with high levels of independence. Well done children. Today the children enjoyed exploring what Astronauts eat during their space missions. They found it very funny that they ate dried food and had some strange combinations such as cheese and crackers for breakfast. They then went on to taste some dehydrated foods such as apples, raspberries, blueberries and strawberries. I think their firm favourite was the ice cream sandwich however, even if it was "crunchy" and "crispy." Last week Miss Lowre introduced the concept of pictograms and tally charts to the children though a discussion she had with some of them during discovery time. This led to most of the class creating their own tally charts and asking each other what their favourite fruit was, recording this on the tables. This week the children have continued to be excited by these and are now enjoying finding out what the children do to keep safe in the sun and again recording this through tally marks. It has been lovely to watch their knowledge and understanding of many different concepts unfold through this child initiated activity. What an absolutely wonderful day. Not only due to our new arrival but the excitement this generated from the children was incredible to be a part of. They were writing cards, banners of encouragement and passages about what was happening, placing them close to the incubator so the chick could see. Then when it had made an appearance, they were so respectful, not touching the glass, making sure they were quiet and being very considerate. Hopefully tomorrow we will see some more movement from the others. This week the children have been creating the most fantastical narratives in the role play space station. From Alien's coming to Earth, to loosing all the stars in the sky. We have had some wonderful stories unfolding and it is great to see the children trying to use our word of the week to develop their play. We had a fun filled day learning about why we were trying to raise money for Red Nose Day and it was lovely to see how emphathetic the children were when talking about where the money raised today would be going and how it would help others. The jokes sent in were hilarious and it was lovely to see how confident the children were standing up and telling them to others. Well done to Nola who won the competition with the following joke: Why can't you give Elsa a balloon? Because she will let it go! We then went to the cake sale and had a hard time choosing what we wanted to buy as there was a wonderful selection. Thank you for dressing your child in all the red you could find and sending in lots of money for them to spend. We had a fabulous day in Reception celebrating World Book Day. So much effort was made with the costumes, so thank you very much for that. The children did so well presenting their favourite books to the class and spoke with self-assurance about their favourite parts of the stories. It is lovely to see them growing into such confident young things. Well done to Evie, our winner of the poster competition and also Daniel and Callum who were the runners up and thank you to those who submitted entries. It was a very tough decision to name the winner as they were all so creative. As you have seen the eggs have arrived and the children have been excited to learn about how the chicks are growing everyday. We currently have 14 days until they should start hatching. This means that the chicks have now formed large eyes, the majority of their bones, their toes and their wings. In the next few days their beaks will turn hard and their feathers will begin to grow. If you would like to keep up to date with how the chicks change daily then please visit this helpful website. The children have been extremely respectful of our new arrivals, ensuring that they do not touch the incubator and that they talk quietly so we do not scare the chicks! The children have very much embraced our new topic already this half term and have been super excited learning about Earth and ways in which we can help to keep it nice, clean and look after it for the future. They have had great fun counting eyes on aliens, becoming scientists in the Space Station and creating play dough UFO's. We have also been exploring teen numbers in maths and the children have been modelling dough to make these numbers to help with their recognition. After attending a course about the importance of vocabulary in Early Years, I have decided to trial introducing 'wow words' to the class on a weekly basis, and exploring the varied meanings they have in a variety of contexts. This is supposed to improve the children's speech, writing and also their confidence, particularly those who currently have limited vocabulary skills. 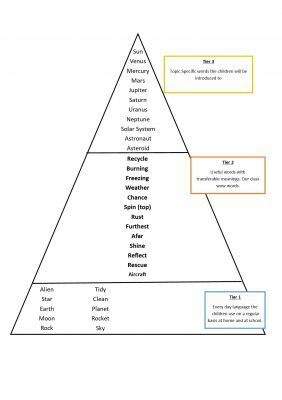 In order to do this I have gathered the common language which children already have prior knowledge of which is linked to our topic (Tier 1 of pyramid.) I then went through the key text we are using this half term and picked words which have many different meanings or may be a little confusing to understand due to limited experiences with these. (Tier 2) We will introduce 1 or 2 of these words a week and look at it in depth to encourage children to understand it's meaning, use it in context and embed it in their mind. We then have subject specific words (Tier 3) which children will access throughout the topic. I will be displaying the pyramid on the learning wall in the corridor and highlighting the words we have explored so you can use them at home too. 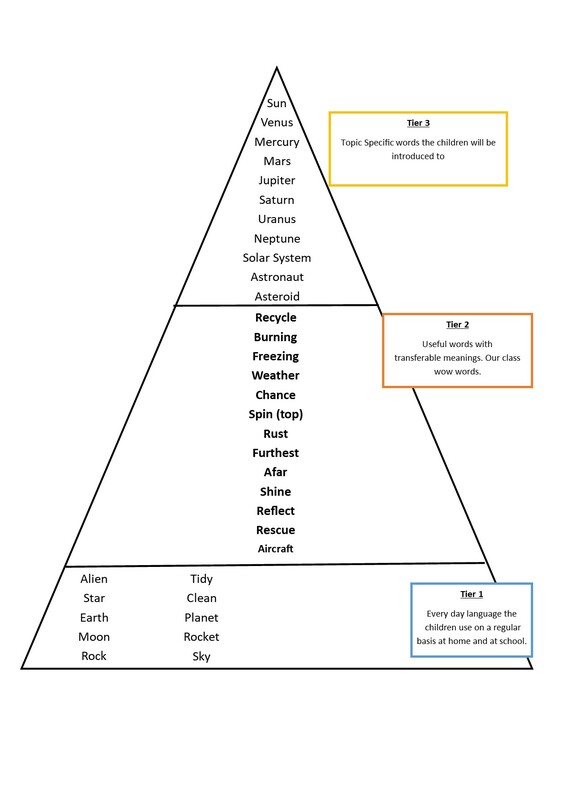 I also invite you to add to Tier 1 of the pyramid with any topic based language your child seems to use a lot and have a good understanding of, this in turn may encourage us and parents to also incorporate these words into our learning. I hope you had a lovely break and feel refreshed and ready for another busy half term in the run up to Easter! Last half term the children really enjoyed exploring different occupations and developed their passion for knowledge as they continually asked questions to find out more about the different roles we have in the community. In Spring 2 our topic is ‘Super Space and Sparkly Stars’, where we will be exploring all things space and use ‘Talk 4 Writing’ to explore descriptions included in stories to learn all about the different planets and stars. The story we will base this around is ‘There’s No Place Like Space’ by Tish Rabe, which is all rhyme based meaning that picking up the facts should be fun and interactive for the children. As you have seen, there has been a hole appear in the school roof so we can now see into space! It appears that an alien has done this to help us with our learning and we will be working to find out a little more about this character this week! We will be bringing all of our learning together and making special space themed t-shirts to wear at our special assembly which you are all invited to and more details about this will come in the next few weeks. We look forward to seeing as many of you there as possible. Towards the end of the term we will also explore the tradition of Easter and the celebrations surrounding this time. We will begin by learning about Shrove Tuesday, where we will make our own tasty pancakes, before competing in a pancake race! The children will then explore the Easter story and take part in some familiar customs such as making chocolate nests, decorating Easter eggs and going on an egg hunt. Some of the class have now finished Phase 3 and are starting on Phase 4. In this phase the children will not learn any new sounds, but they will be learning how to use previously learnt sounds to write CVCC words and polysyllabic words (words with more than one syllable) such as farmyard. Some of the class will be recapping the phase 3 sounds to help to consolidate their learning as some of the trigraphs ( 3 letter sounds eg ‘igh’) are a little difficult to remember. Any work you can do with them at home to help those who may need a little extra support would really help your child to become more confident in this. Phase 4 Phonic book marks have also been sent home this week, please keep using these when reading with your child to help them develop their sound and tricky word recognition. The children have shocked me with their progress in reading last half term with many of them confident in sight reading common words as well as those that are tricky. We will start guided reading with those who are confident readers which will build on the children’s comprehension skills as well as their actual reading ability. We do this through ‘clarifying’ words which they may not know the meaning of, and asking them to ‘summarise’ pages they have read and draw conclusions from both text and images, Reading books will continue to be changed on a Monday as it allows enough time to revisit the text a number of times to build the children’s comprehension skills as well as their reading. In our Literacy lessons, the children will continue applying their learning from our daily Letters & Sounds sessions through a guided literacy activity once a week and then independently during the Wonderful Writing task. This half term will focus on using dazzling describing words to define characteristics of planets, write letters to aliens and create food menus for astronauts. Most children have grown in confidence with their writing this half term and are enthusiastic about doing it to a high standard. It is lovely to see them beaming with pride when they have completed a piece with independence and remembered all of the key features such as capital letters and finger spaces. I can see those who complete their home learning tasks regularly and with little support are absolutely flying with their writing, so thank you so much for supporting their learning at home. I have included below some examples of the writing to show where I would expect children to be at this time in the school year. Obviously all children learn at different paces, however it is sometimes helpful to see where we are aiming to get them to. If you think your child finds certain elements of writing difficult then please come and see me and we can support them with this together. We will be focusing on number again this half term, this time exploring problem solving techniques. This will look at adding totals, subtracting, doubling and halving and sharing different quantities. They will also continue to look at ordering numbers to 20 or beyond as well as stating one more than and one less any given number. Some children are finding the numbers 12,13,14 and 15 difficult to remember when counting or ordering so this will be the main focus with starters during lessons as well as with home learning tasks set. This half term we will be focusing on ‘saying sorry when I have done something wrong’ and also ‘comforting others when they are upset.’ As well as this, we will also be revisiting ‘Always doing what my teacher asks’ as there has been some behaviour issues last half term with some children displaying a lack of respect to adults which is obviously unacceptable and could potentially be dangerous. We will be exploring these concepts during circle time lessons. I am pleased to announce that we have some new members of the class this week. We have chick eggs! We will be incubating these for 20 to 22 days with the hope of hatching 7 little chicks. Obviously due to nature, it is not guaranteed that all of these eggs will hatch, however we will do everything we can to nurture the eggs and tackle this topic sensitively with children if needed. We will then keep the chicks for around a week before returning them to Little Morton Farm where they will be looked after until a home is found for them. This is such an exciting learning opportunity and would not have been possible without your support with our enterprise projects which enabled us to raise the funds to buy the equipment, so thank you very much. Some names have worn out of PE kits so please can you check that names are visible as there has been numerous things lost or misplaced when getting changed and my pile is getting bigger each week. Thank you for putting so much effort into the home learning tasks to document their home school learning collaboration. This allows me to get a true picture of how your children learn and assess them accurately. We are now leading into targeting the Early Learning Goals for those who are on track to meet these towards the end of the year, with this in mind I have attached some more information regarding these and some helpful things you could do at home to support your children achieving these. If your child is not yet here, please do not worry and do try some of these activities too, as this will also help. Class helper- we are still looking to have a class helper to read with children weekly, if you could give some of your time this would be greatly appreciated. World book day is on 7th March 2019. Children will be invited to dress up as their favourite book character and bring the book to school with this character in, in their book bags. Wow, what a brilliant first 2 days back. The children have returned to school with such maturity and a very positive attitude to their learning. Today we were learning about Earth and how we can look after it. The children then wrote sentences about this and the work they produced was wonderful. They used their sound knowledge well to segment words into their sounds and spelt tricky words correctly without prompting. Well done children and thank you to those who have evidently been practicing at home, it makes such a difference. We were extremely lucky to have a visit from the Book Bus on Friday. Many of the children enjoyed visiting this either with us or with an adult and many books were purchased. Thank you to anyone who did buy a book and support your children's love of reading. It was lovely to see so many of you showing your support with Safer Internet Day and take part in an online safety lesson with your child. I hope you found it useful seeing what devices the children use in class, as well as the messages raised in our lessons in Reception. This week the children have been exploring people who keep us safe as well as 3D shapes. They have been very curious about both and enjoyed making cone party hats, taking on the role of doctors and nurses in the role play and being builders, creating safe structures as well as building words using nut and bolt letters. 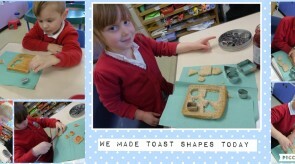 Today we finished off our 2D shape exploration by making toast shapes whilst discussing the properties of each. The children then spread these with jam and enjoyed eating their creations! I am very impressed with the mathematical language the majority of the children have picked up and their confidence when naming some of the more obscure shapes such as ovals and pentagons! Well done children. The children have come in to school today so enthusiastic to learn about people who help us at school this week, as well as 2D shapes. 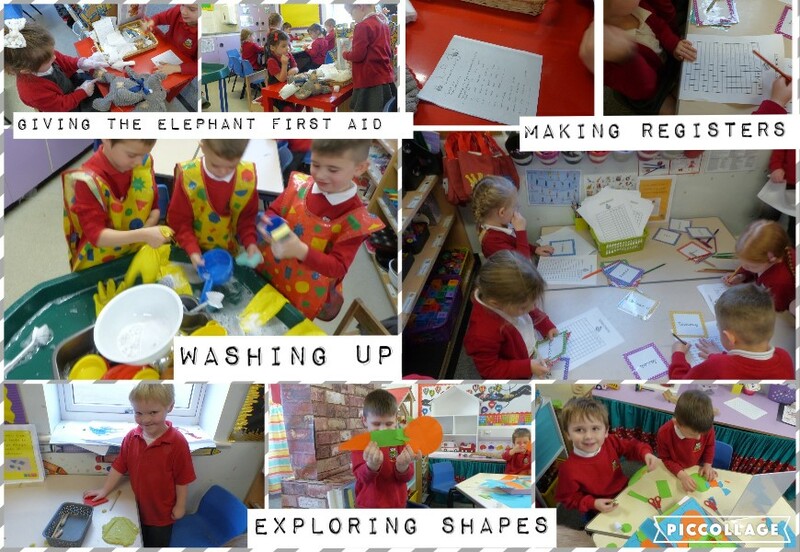 They got stuck into exploring all of the different activities and extending their learning in many different areas. The children have come back to school after the break very eager to learn and have got stuck into various activities which have introduced them to our topic 'Real Life Superheroes.' We have focused on exploring all the different people who help us at school so there has been washing up like dinner ladies, giving first aid to a poorly elephant and making class registers. We will be focusing on looking at non-fiction texts this half-term. Here we will be exploring how these differ from picture books and identifying some of their key features. We will also include the talk4writing practice that some of you witnessed on the video posted on Class Dojo of our rendition of Jack and The Beanstalk. This encourages children to organise facts as well as recognise language used when writing them down. Using similar techniques we will also learn a version of the story ‘Cops and Robbers’ by Allen Ahlberg. I have noticed that some children are still very dependent on adult support when writing. If children do any writing at home I advise that you help them plan it by saying the sentences together a number of times, marking each word by using your fingers (a video will be posted on dojo about how to do this) and then leaving your child to write the sentence on their own. This may be a challenge at first, but it will help them read over their work to see what sounds come next as well as develop their critical thinking skills, enabling them to sequence their own ideas. Once they have completed this, I would recommend going over their writing and correcting one or two things such as letter formation, or adding in some missing sounds. This again encourages your child to think about reading over their work and editing it. Children are making great progress in completing their passport targets. We will be focusing on ‘solving a problem without arguing’ this half term and try and encourage children to use communication and kind gestures to keep play going when challenges may occur. We are in desperate need of parent helpers to listen to readers at school. If you are able to give up an hour of your time, then please let me know. I have noticed that since the Christmas holidays a large amount of children seem to have lost some of their independence, making it difficult for them to access the learning as they require continuous adult input in order to carry out simple tasks and often expect the adult to do everything for them. Please try to encourage children to do little jobs at home such as set the table, make their bed, match socks etc and this in turn should help them regain their independence and allow them to redeem critical thinking skills, encouraging them to process information by themselves and act on what they have heard with little adult intervention. If independence is lacking, children will find making progress very difficult as they become reliant on an adult doing absolutely everything for them which is not beneficial in the long run. Welcome back, I hope you had a restful break after such a busy, but fantastic first half term. I am extremely pleased with how the children are settling in and can already see some brilliant progress as they embrace all the new topics and learning concepts I keep sending their way. Autumn 2 is going to be another action packed half term, particularly with all the celebrations in the run up to Christmas which is always an extremely exciting time of year for the children. Thank you to those who attended Parents evening at the end of the last half term. It was lovely to share with you what they have been up to and the progress they have made. This half term we will be looking at Traditional Tales. We will be focusing on exploring the language included in these books, different character roles and beginning to learn how we can be authors and change elements of a story ourselves. We will also be learning about celebrations and family traditions such as Diwali, Firework night and Christmas. To help your children develop in this area it would be great to share some of your favourite traditional tales as well as the more modern ‘messed up fairy tales’ which often tell the stories from a different perspective. This will help extend the children’s vocabulary even further and also explore the concept of differing narratives. The children are rapidly picking up each new sound introduced as well as the skills needed to read and write words and captions. Due to their hard work, we will be finishing Phase 2 in the second week back and then move onto Phase 3 where more sounds will be introduced as well as high frequency words(HFW) and common exception words (Tricky words.) New bookmarks will be coming home with your child. If you could attach these to the others on your reading log then this would be great. I hope you have found the video I have recently shared on the Class Dojo page as well as the Facebook group which showcases how we teach and develop reading skills in Reception. I have had a few parents say that their child is a little reluctant to read at home. This could be due to a number of things such as time of day, lack of understanding of the narrative so it therefore becomes boring, or un-engagement. To try and help with these issues I would firstly suggest picking the reading time according to your child’s mood. If you know your chid is more responsive in the mornings, try and have a morning cuddle and spend 5-10 minutes reading before the morning kicks in. In order to hook the child into the narrative and also help them learn how to understand these through the use of pictures and text you could first act out what you think will happen using the pictures to help before ‘being a detective’ and actually reading the story to see if they were correct. Along with the reading books, we will also be sending some nursery rhyme bags home with 6 children every week. These will have a rhyme and some props included in it which you and your child can use to act out the nursery rhyme, sing it in different ways and learn some new vocabulary linked to these. It should work out that your child has 1 of these bags sent home each half term. Literacy will focus on encouraging children to use their phonic knowledge to segment words in order to build sentences with less adult support as previously needed, due to the majority showing great understanding of how to use skills taught in phonics lessons to do this. We will also be using ‘talk 4 writing’ methods to look at Jack and the Beanstalk. I will be including lots of videos on Class dojo so that you can see how talk 4 writing is used to develop children’s language and understanding of the features of a book. This will give you insight into little activities that can be done at home to help develop these further. I will also be showing you how we encourage children to write independently, without copying words and going over dots to help them grow into independent writers. The response to the writing home learning activities has been fantastic and the children are consolidating skills learnt at school very quickly by practising them at home too. This will continue over Autumn 2 and I will now include a maths activity linked to what we have been learning in school. It has been fantastic to see how many children get excited about this weekly and I see a huge difference in the children who complete it regularly. May I remind you it is not compulsory, however strongly recommended that this is completed as again it consolidates skills and builds independence. This has really helped the children learn to write their names with the majority conducting it daily so well dome to those who have kept at it. I am going to change this for Autumn 2. Now I will be putting a simple picture up with a phoneme frame underneath to show how many sounds are in it and your child will have the write the word on a post it note. This will help them develop their segmenting skills. You may need to help the child repeat the word in robot talk to distinguish all 3 sounds in each word but please refrain from just telling them the sounds. There will be a green box next to the book bag box as of this half term. Please could reading records be put in this every morning as we will be starting to do individual reading with your children. This way it will make it easier for us to let you know how your child has got on during these sessions. We will continue to change books weekly every Monday. I have included two more information sheets about how to support early literacy development with a little questionnaire to help you asses the level that your child is at currently and some ideas to further support them. Please note it does state on it that ‘too much pressure at an early age can create literacy difficulties.’ This is extremely important as pressure can lead to low self-esteem and also reluctance. This doesn’t mean you give up trying if your child is a little reluctant, it means you try new strategies to engage them. I have also included some maths ideas for home. Again these are not focused solely on boys and would be very useful for both genders learning development. As of this half term I will be introducing the ‘Bear Adventures Book.’ The child who receives the star award on a Friday will get to take home a little box with 2 bear dolls in and a selection of clothes. Your child will then have to dress them appropriately (independently to help fine motor development) and take them on an adventure. They will then draw a picture of the bears or take a photo and write a sentence showing what they have been up to for the week. This only has to be one page, however if you would like to complete more that is fine. The bears will be sent home on a Friday and returned the following Firday, allowing you enough time to complete it. Please be aware I am not looking for correctly spelt sentences as the children are not at this stage and this is a clear indicator that lots of adult input has been given. I am looking for children to sound out words using their phonics, however they may need you to repeat the words to do so and also reminding of what these sounds look like by pointing them out on the alphabet mats sent home. I look forward to seeing what the bears get up to when in your care. Class Dojo- There has been a wonderful response with this, with only a small number of parents not joined, I hope you are finding it useful seeing what the children get up to and as an easy way of communication. Boisterous behaviour- With the class containing many boys this year, there is often lots of rough behaviour within the class and at lunch time. This is often not meant maliciously, however can lead to others getting hurt or upset. With this in mind, if children are playing roughly with siblings or parents, please try to encourage the behaviour expected at school so that they can easily distinguish between what is ok at home and what is ok at school. Hopefully this will then cut down on the number of incidents we have daily. We had lots of fun exploring the traditions of Diwali. We have been busy making Diva lamps, firework paintings and learning all about the story of Rama and Sita. The children were beautifully behaved during the workshop and listened to our guest speaker. I was very proud of them all. We have been working hard to decorate our rocks when learning about Remembrance day today. The children have created some wonderful poppies which they will be able to hide around the village for others to find and take to the church this Sunday. We have been tasting lots of different fruit and vegetables today whilst learning about healthy eating. Some of these included grapefruit, celery, mango, peppers and limes. We then blended these together to make smoothies. Some were better received than others as you can see in the pictures! There was also beetroot in some of them, just as a warning if when they go to the toilet it has red in it!! I didn't want you to panic! We have been exploring Mary Secole today as part of our Black History Day celebrations. We smelt different herbs and spices before making our own remedy. Please do not let the children drink these as we have added some glitter to make them magical! Thank you to all those who attended the tea party today. It was such a calm and positive afternoon with lots of team work on the activities which celebrated our unique families. Thank you also for all the cakes supplied, you are a talented bunch. I hope you all enjoyed it as much as we did. Children access a lot of their learning through child initiated play. With this in mind we encourage the children in Reception to explore lots of different activities inside and outside of the classroom to generate curiosity and nurture their development during discovery time. Here is a little snippet of some of the things the class has been up to this week during this time, as I know often when you ask what they have done, they will reply with short answers, if anything at all! Thank you to all those who gave up their time tonight and attended the Phonics information evening. I hope it was beneficial and you haven't gone away feeling overwhelmed. It is a lot to take in and will take a little time to get your head around, but hopefully I have given you some options as to where to go to continue to develop your knowledge as well as your childs. Here is the link to the presentation that I used if you were unable to attend. It is an honour to welcome the children and parents into Reception, with a special welcome to the new children and families joining the Barlborough Primary School family. I am very much looking forward to getting to know each and every one of you, along with your little ones over the coming weeks. The main priority in these first few weeks is to support the children as they transition into school life and make them feel comfortable and safe as they settle in to their new environment. Book bags will go in the box on the shelf by the door of the cloakroom (this is labelled) and lunch boxes in the one above. Our topic for this half term is ‘Marvellous Me’ where the children will explore lots of different and unique ways which make them special. Here we will explore their original features, their interests and unique characteristics. This will then lead onto learning about families and how they differ from one another. Finally we will explore the amazing human body and why it is important to stay healthy. To make the topic more appealing, we will be using books by Lisa Bullard which explore the similarities and differences between ourselves, our families and our homes. They offer a great insight into cultural diversity also. We will be celebrating our wonderful families with a tea party towards the end of the term where parents will be invited to come in and participate in activities with your child which promote the unique nature of every family. This is often a very popular event, this will be on Monday 8th October at 2.15pm-3.15pm. Please look out for the letter in the next few weeks and reply promptly as it will operate on a first come, first served basis. As phonics begins I will be sending home handwriting practice sheets. These will be sent out on Thursdays and should be returned the following Wednesday. Please note that we teach the children to write with a pre-cursive formation and this should be continued at home as going between writing styles could confuse your children as well as delay their development in writing. It can be a little confusing at first and may make your child’s handwriting appear messy, however it is essential that you continue to practice it this way. Please refer to the videos above or the handwriting booklet sent home in your transition packs. At Barlborough we use a ‘Passport system’ to encourage children to work towards targets which encourage and promote good citizenship skills as well as link to British Values. The first passport they will start on is an Orange one. We will be concentrating on saying please and thank you and helping keep the classroom tidy this half term. Miss Heath-Smith will lead the class on Tuesday afternoons as it is my allocated planning time. Here they will do Forest School, where they will take part in natural learning activities. If you have any questions about any of the above or any other queries please do not hesitate in speaking to Mrs Gilbert or I, we are always happy to help and understand there is lots of new information to try and process.